Borders can be narrow or wide ... and quilts can even be borderless! You might want a one layer border ... or several layers. Telling us the block size does not give us a full idea as to what the quilt might look like. Showing us the quilt ... and the ideas may overwhelm you! That is your decision. Friends of mine usually go with at least 1/2 the size of the block. If squares are 8 1/2 then 4-5 inches for the borders. Just google "What size border for a quilt", lots of information. Good luck. how wide does it need to be for your quilt to hang over the king size bed enough. I've seen 10 inch borders. so it all depends. Would love to see a picture of your quilt squares - are they sewn together already? Well I agree with nativetexan, it is going to really depend on how much more you need to make it fit your bed. I will tell you I enjoy looking at quilts with more than 1 border, in most cases. Hope you will post a picture. My personal preference is to put at least two borders on all my quilts. 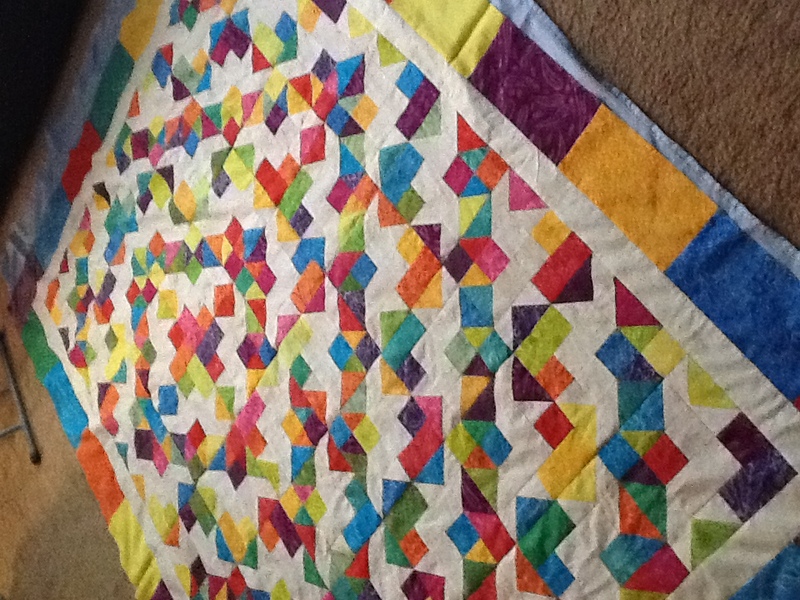 The first is what I call my "stop" border and is a contrasting color to all the colors in the quilt. I usually make it 2" wide. The second border may be one fabric or may be pieced from all the left over fabrics that are in the quilt and is usually at least 4" wide. I like rail fences where the rails are differing widths from 1-1/2" to 3" in half inch increments, but I also cut pieces that are anywhere from 5" to 10" long for a blockier border. I may put a 3rd border on after the pieced border, which is usually the same fabric that I use for the binding. This is the last quilt top I finished for my youngest grandson. The stop border is from a jelly roll I had leftovers and the outside border is from layer cake squares I had. Most of them are 9-10" long and 5" wide. I haven't decided on the outside border, but will probably do a bright blue border and binding. Last edited by mckwilter; 07-25-2013 at 07:13 AM. I tend to like a two inner inch border and then a five inch outer border...cut at 2 1/2 inches and 5 1/2 to get that size. BUT, you need to "audition" several ideas and see what looks good to you. I also prefer my outer border to be darker than the inner, and I like both to be out of fabric that is in the main quilt top. Now, if you really want lots of ideas, take a picture of your top so far. You will get more ideas than you know what to do with, I promise.